Thoughts From Three: March, etc. After the success of Jim Vermeulen's XC Journal in the many falls of Cross Country, we've asked again for him to provide some news and notes once a month. Think of these as the thoughts that cross the mind of your average coach. Up from Section 3, we present you with "Thoughts From Three." "You can't know who you are, if you don't know where you are." It is impressive in a curious way. I am no longer surprised by how a few students each new season can take up their time and some computer bytes with the Family ID registration process, respond for several days during attendance with a "here" from the back of the room-and then simply vanish. No phone call, no email or text, not even word delivered through another team member. Just gone. They do not, of course, respond to my emails with any reasonable explanations. Absence speaks for them. That ability to simply shuck a chosen activity, as though pulling off a raincoat once inside from a bad storm, is an intriguing skill-and one at least a little troubling. Sometimes I wonder what they think as they walk away, melding back into the school population without a backward glance. Sometimes I wonder if these folks have gone into the Witness Protection Program. I arrived early with the recently purchased shovel and rake. High hopes led me and my shiny new implements to the LJ/TJ pit, expecting to turn over the winter-compacted sand so my small group of hopeful pole vaulters could perform pit drills, swing-throughs with drive knees held high. The progression is simple, though not easy: 6 swings from a 2 step start, then 6 from a 4 step start, then 6. After a week-long sequence of snow, rain, frozen rain, rain mixed with snow, that simply drill would be a good first day in the suddenly-luxurious 56o weather. When I approached the pit, however, I noted a splotch of snow at the take-off end. I stepped into the pit to have a look and my shoes sunk into three inches of sand ooze. Stepping out and shaking off, I took the rake and tugged at the ooze, scrapping it back to reveal a lower level of rock-hard frozen sand. Our science teachers could have trotted out students to marvel at this West Genesee version of north Alaskan permafrost. The pit was left to melt, and I considered the alternative, which, in the end, worked fine. The infield grass was soft enough to absorb and hold the vault poles. The girls who assembled later in the workout were enthusiastic, following instructions and asking the right questions as they swung into-and through-their short arcs, most with knees held high in the drive position. By the time we finished, the practice area was dotted with small, inverted knob holes. One of the girls peppered me with questions. Had her knee been driven properly? Did I think she'd had a successful first lesson? Could she become a good vaulter? I answered that it certainly looked that way. Two others came up and told me they weren't sure pole vault was for them. I said that was fine too. The snowflakes, large and lazy in the null winds, drifted across the faces of our trim and quick distance runners as they circled the track. So it happened that from the time I'd walked into the high school a half hour earlier for attendance and a hall warm-up, clouds had drifted in from the northwest and the partly sunny afternoon changed. 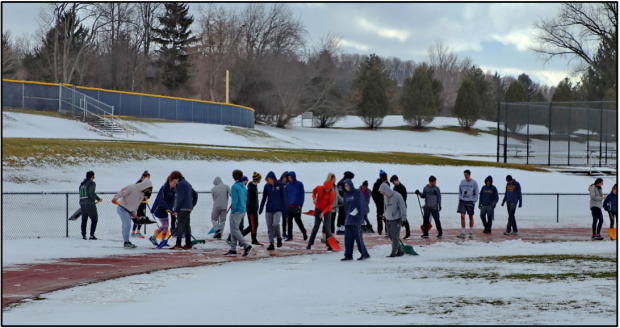 But it was a listless snow, so we stuck with the plan--four sets of 2 x 800m at 5k pace on the track, separated within by a 200 meter jog and in between by a 3-4 minute recovery. It was that division into sets, I told them, that would allow most to manage sixty-four hundred meters of good aerobic work with power and form. "What you are looking for," I added, "is to feel relaxed at the pace. Powerful, but relaxed." As they launched into their second set, the snow intensified-or maybe the flakes just got fatter. The runners churned funnels through the slow swirls as they ran their eights, then collected snow on heads and shoulders as they slowed with their recoveries. Then the sky lightened a bit; clouds thinned. The runners grumbled, griped, and launched themselves on another set. While they circled, as though someone had pulled back a curtain, the sky cleared. They ran their final sets in bright sunshine, even though the temperature slipped. I told the first finishers to put on jackets and record set times. When they'd all assembled, I announced the afternoon's finish would be fast. Eyes rolled and heads dropped, thinking an all-out 400. "Naw, this will be fun," I told them instead, sending groups to the other side of the track for a 200m blaster. One runner being held out did the starting chores while I clocked finish times, then read them out as the next group queued. The girls front group came last. It had been a strong day in a tight formation for them, and it was Mia who powered home first in the two hundred with a pretty good clocking. Standing in a small circle as they breathed heavily, I read out their times. Mia had already decided how the day had gone. When she got her time, she nodded, smiled and announced, "I'm proud of myself." Our initial confused weather weeks eventually give rise to more than tree buds and greening grass. Toward the end of those weeks--and once the initial enthusiasms have waned-usually lies the first barrier point (there will be others) where some promising athletes complete an initial sport calculus and decide that less is good enough, that they know all they can muster. A coach, at this point, has both options and decisions to make. A lot of time and energy can be expended attempting to change an individual attitude or investment in the sport. While most athletes with conscientious coaches can expect these attempts, after a few of them, high hopes for those folks begin, in fact, to run counter to the accumulated and institutional wisdom of veteran coaches, one that can summarized by the well-worn maxim that sport does not create character but merely reveals it. Usually, though, we keep at it; you have to try. The other available option is to simply trust the program and its ingrained encouragements, to be reassured of the opportunities it presents team members to value effort and commitment as prerequisites to meaningful achievement. In that place, you've stepped back a little, encouraging when possible, but being patient, waiting to see what happens. Sometimes the strategy is a little of both, but coaches know that any of those options risks leading eventually to the same place, the same disappointments. Early on, in the morning, I had the opportunity to second-guess my plan to run the Friday 20-minute threshold workout inside. The track, this day, was clear. But on the drive to the high school, windshield patters of the predicted light rain turned to the thwap of wet snowflakes. I walked inside through a mounting barrage of white, my initial decision reaffirmed. The distance squad, following exhortations to focus hard on the threshold piece of the workout day (speed and weight-room segments to follow), re-assembled upstairs at our aptly named Grand Prix course. Coach Mercado was also there with his girls' sprint squad, but we'd worked this raucous mix before, so both groups simply readied, with distance logging their warm-up lap of strides-on-the-straights. There is one long hallway and several other small ones on the Grand Prix, interspersed with ten corners that link the various straights. The trick is to set up the corners properly, so you maintain as much rhythm as possible--and thus the integrity of threshold pace. We figured doing that was a far better alternative to blinking snow out of the eyes and leaning into cross-winds on the track. Bunching runner groups up, I set them off all at once so everyone's duration was on my stopwatch. All they had to do was count laps; the later calculations of mile paces would be easy. I stood two-thirds down the longest 120 meter straight where a side hallway allows sighting runners entering the back turns. There was, of course, no way to clock actual paces. Those calculations were intuitive, based on knowing the runners well enough to read body positions and facial expressions. It was week three. With the newbies, I had already mentally catalogued all their forms and mechanical idiosyncrasies. The density of the week's work pointed toward running the threshold in a pre-fatigued state-and I warned them of that. But once they got going, circling in small groups or dyads, with some--like Matt--as loners lapping teammates, they did not look pre-fatigued. In fact, I watched the opposite. Most powered on that threshold balance point, confident. Further into the run and in between call-outs of time elapsed, I listened to footfalls, expecting to hear the thumping evidence of tired legs. There was little evidence. When the time expired and I blew the whistle, the runners reassembled at our staging point for water and to record laps. Through the block-glass windows, refracted sunlight glanced downward. So much for snow-for now. The runners, surprisingly upbeat, had inklings. Some remembered previous Indoor Track lap-counts. Justin made me promise to email the results that night, but most were content to sip from water bottles and chat. Then we began the long hall sprints. It wasn't until later that I finished the calculations at home, shook my head and checked back through previous work-out logs. Wind-whipped snow had already piled up in the back yard. A storm warning was in effect and would make their recovery Saturday all the more timely. I emailed the results, with little comment, out to the runners. "Woah, just woah, that's all I have to say about that run," Matt wrote back. I once contacted the national MileSplit site to suggest linking my monthly columns to a wider audience. I was politely told they were interesting enough but "too regional." Now, with bright sunshine and the arrival of a big melt-down, it looks like we might avoid a second shoveling for track work to continue. Still, it is an unwritten rule in this unruly region that most workout planning begins with the same question: what is the weather forecast? As far as those national MileSplit guys are concerned, I guess I'm going to agree.